The days have flown by, and now all that is left on our trip is our last match and our long journey back to England. With the boys finally flagging on Day 11, breakfast was a slow affair, but they managed to muster their strength and leave on time for their respective fixtures. The 1st XI would be playing at the Moratuwa De Soysa stadium, and the 2nd XI made the short journey to the MCC Lords ground in Hikkaduwa. Our final leg of the tour was spent at the Coral Sands Hotel in Hikkaduwa, just north of the historic city of Galle. Situated on the south-west coast of Sri Lanka, Hikkaduwa is a popular destination for holidaymakers owing to its glorious beaches, seaside restaurants and scenic hotels. From our temporary abode, we would travel far and wide to games in previously visited stadiums, as well as new ones in close proximity. The motorway was, fortunately, in action, despite the vast number of peacocks, cows and stray dogs that seem to wander down it! 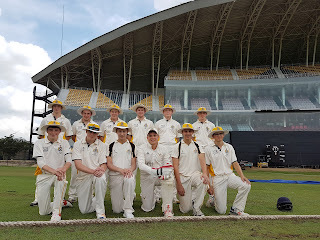 On day 9, the 1st XI travelled 5 minutes to the MCC Lords ground to face the “FOG Academy”, and the 2nd XI went back to the Maratuwa De Soysa Stadium, where they had been previously successful, to play against the British International School. George Politis, Alex Barker, Harry Whitehurst… and some rather snazzy trousers! 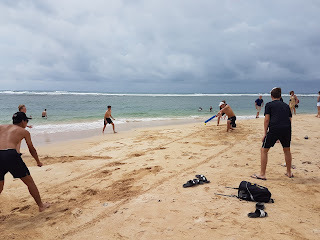 It was another early start for our boys on Day 8 in preparation for our journey to the south-west coast of Sri Lanka to the Coral Sands Hotel in Hikkaduwa. But before we left Udawalawe, we had one more chance to see elephants feeding in transit. Once Mr Miles was satisfied that we had our full complement ready to go – any excuse to count; he loves counting – we took the bus only a few hundred yards down the road to discover a hidden sanctuary for elephants. There were over 40 elephants and baby elephants (more counting, more fun) casually having their breakfast and bathing in the morning sun. We also found an even rarer sight which was a photo opportunity not to be missed: two rather happy Burnley fans after The Clarets win the night before. What are the chances of that!? Elephants, and the rarest sighting of the day: happy Burnley fans, The Sutcliffes! It was time for Day 7, and also time for the highly anticipated visit to the Sooriyawewa International Stadium in Hambantota. The ground, which is also known less commonly as the Mahinda Rajapaksa Stadium, was only 30 minutes from the hotel and was built for the 2011 Cricket World Cup. It only hosted 2 games at this event, and has been sparingly used for international T20s since. 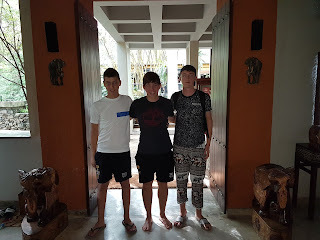 Having narrowly avoiding monitor lizards enjoying their breakfast on the roads, we arrived at the 35,000 seater stadium with time to spare, allowing the boys to wander around the facility and enjoy the morning sun. It was time to say goodbye to Colombo and the Pegasus Reef Hotel on Day 6 of our tour of Sri Lanka. Having rallied the boys and packed the bags, we boarded our “Golden Dragon” buses and embarked on a long and winding journey to Udawalawe. Weaving our way through small villages and dense jungle, it took nearly 5 hours to arrive at our destination. We passed via Ratnapura – meaning “City of Gems” – dreaming not only of wealth and gold, but also of a richness of runs against our next opposition, the Lancashire Cricket Academy. 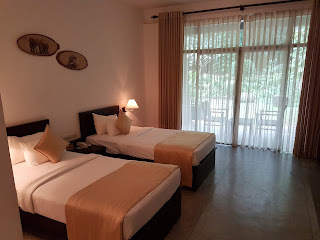 However, first on the agenda was a safari, and after unpacking at the Grand Udawalawe Hotel, and viewing the elephant-sized bats in reception, it was down the road to the safari resort.